The rasps and strawberries are sadly a distant memory, but there’s still fruit picking to be done. I was determined to harvest before I lost more berries to the birds. They’ve had my red and white currants and have moved on to my blueberries. 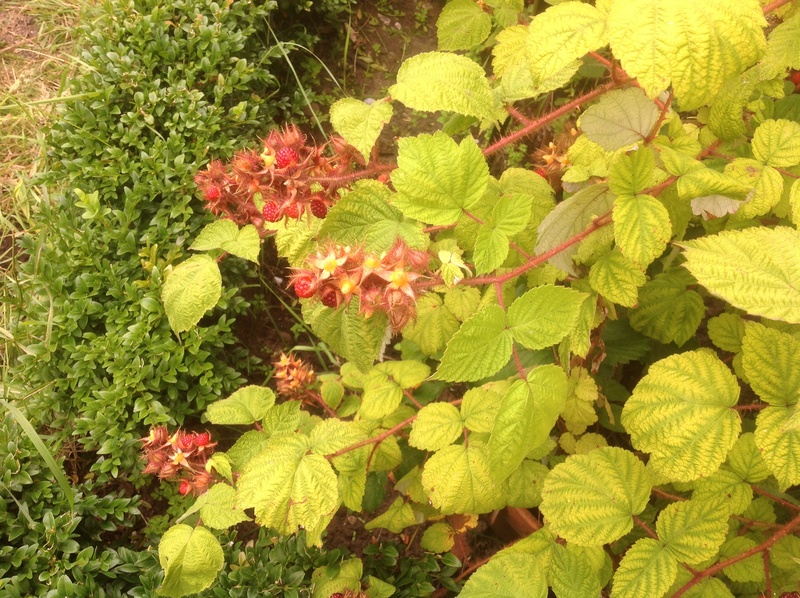 It was time to gather the latest crops of blackberries, blackcurrants, and Japanese wineberries. And so I move onto my love/hate relationship. I don’t know how many of you are familiar with these berries. These were the handful of berries I showed last week. They are not so widely known as the berries we normally grow in our gardens. 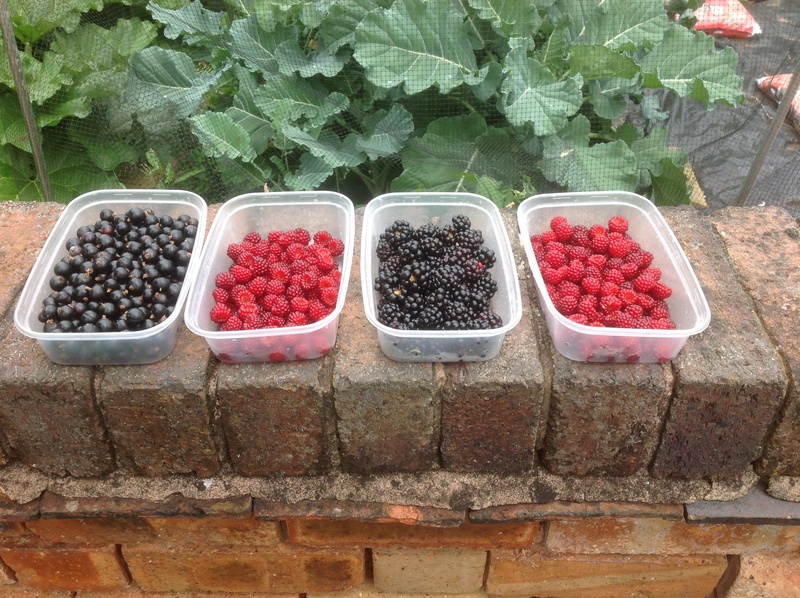 We have the run of the mill raspberries, blackberries, tayberries and strawberries, along with varying shades of currants, but we had space for one more bush, and I fancied something a bit different. And different it is! Different, in the fact it isn’t a hybrid berry, like the Tayberry, but a species of its own in the Rubus family. And different, in that it is highly decorative in its own right. It has long arching stems, clothed in soft red hairs, that appear so very tactile. But stroke them at your peril! They disguise the small, sharp thorns that also protrude along these stems. The leaves, as they age, pale to a lovely, lime-green, that really contrasts with the red of the stems. So now, at harvest, it is a striking looking specimen, with its terminal clusters of wine-red berries, that seem to glisten like little jewels. They taste similar to rasps – sweet and sharp, but not so aromatic. And you grow and treat them in the same way, too. Once the fruit is picked, they leave behind their stalks, (like all good berries should do!) which look like tiny orange stars. And there’s more! Once this is all over, the leaves take on beautiful autumn tones of pink and orange, before dropping. What’s not to love? Well, it is a very vigorous shrub, shooting up strong new shoots in all directions, that’s a two man job to control. They get you from all angles! 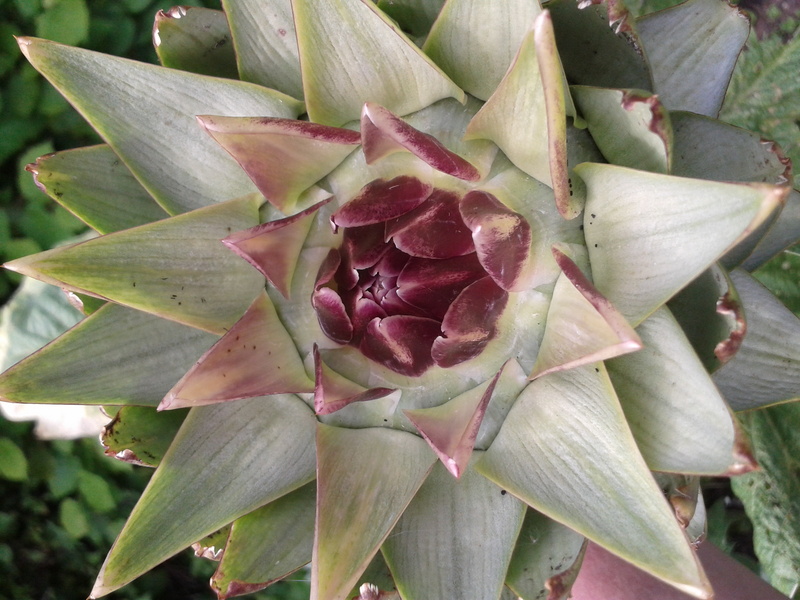 As for harvesting, they are quite prickly, which isn’t too bad while picking, but a hazardous experience while being attacked by the new stems. Mind you, my support system is rather ad.hoc. so maybe that’s down to me! These glistening berries, are also rather tacky, leaving you with sticky fingers afterwards. But nothing soap won’t put right! So, all in all, the love out weighs the hate, now that I’ve extricated myself from its clutches! But why can’t it be more like its well-behaved neighbour, the compact, self-supporting and thornless, blackberry “Loch Ness”? 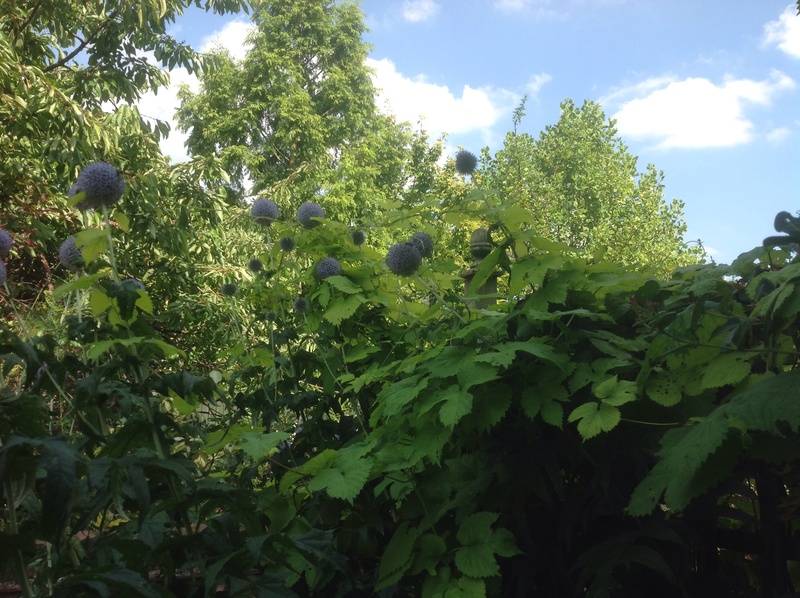 This entry was posted in Uncategorized and tagged Allotment, Blackberries, Japanese wineberries, Soft fruit on July 29, 2014 by thelonggardenpath. This wonderful week of weather has had us appreciating a summer breeze – as I am at this very moment, enjoying an aperitif as the sun goes down, and the breeze rustles through the trees above. Bliss! 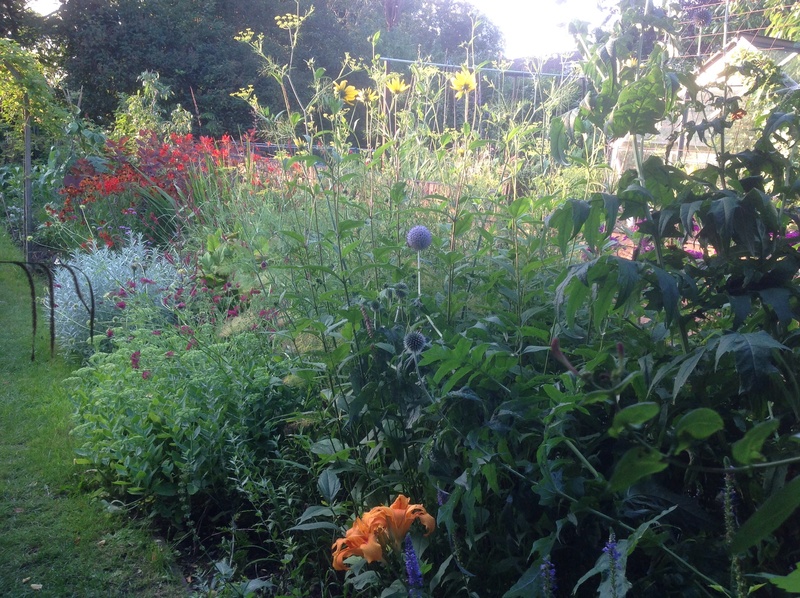 This is when a lot of scented plants come into their own, becoming stronger in the evening. 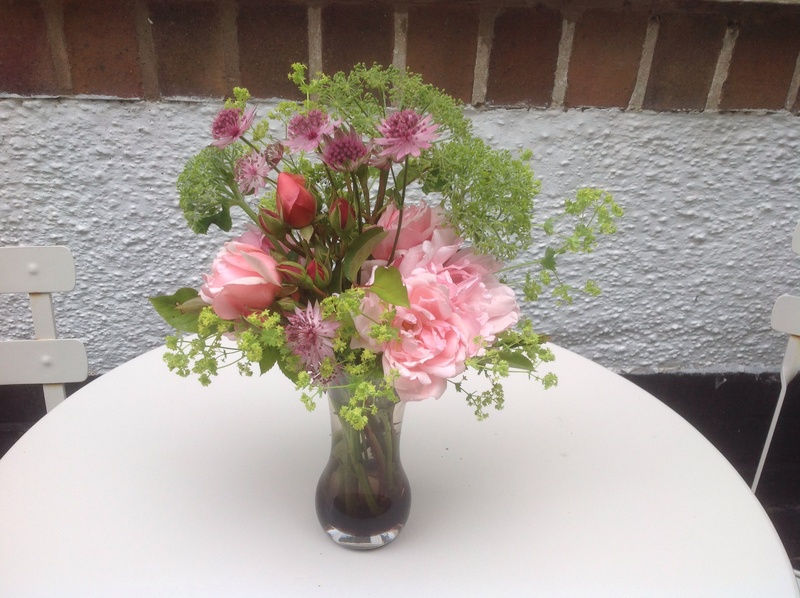 Plant them close to a favourite evening seat, and it’s heaven! If backed by a warm brick wall and enclosed, as we are, even better! Many of these are climbers, including our jasmine, Jasminum officinale, which grows over the pergola framing our dining area. No scent can be more heady than jasmine! It just whisks you off to exotic foreign climes! But it does have a bit of help. Against this brick wall, either side of the chiminea, grow two Trachelospermums. 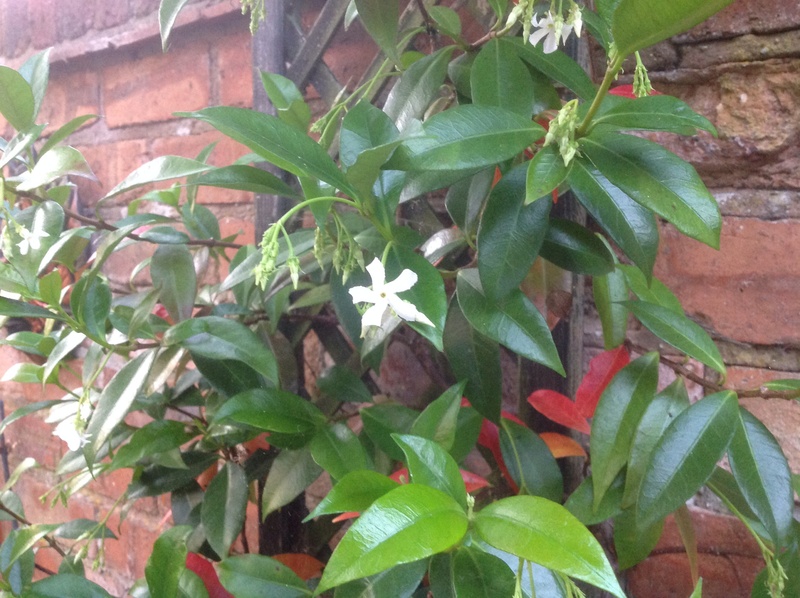 This one is Trachelospermum jasminoides, and is just coming into flower now. 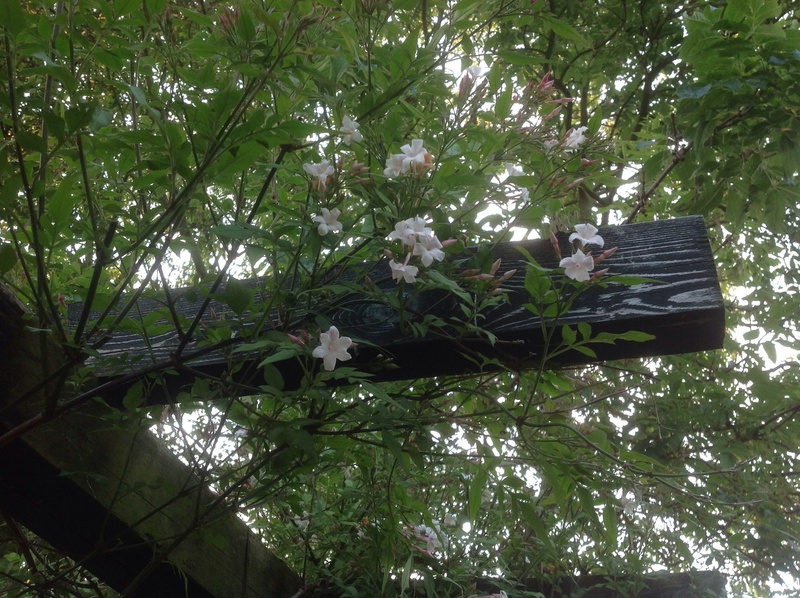 It is, as its name suggests, very similar scented to jasmine, though not quite so heavy. Its flowers are like tiny white propellers or whirligigs. The plant itself is an evergreen shrub. The Trachelospermum on the other side, is asiaticum, which is very similar, but with creamier flowers. I have found that it is not as floriferous as jasminoides. No flowers there, as yet. 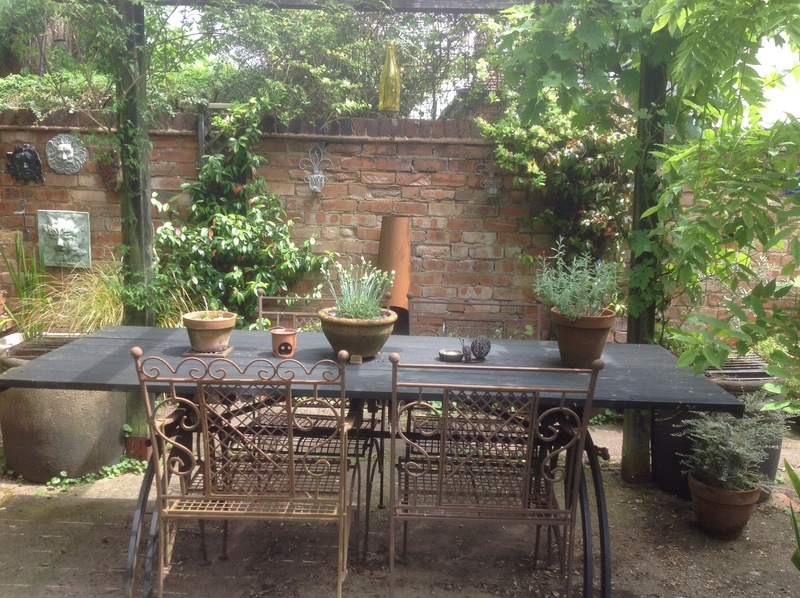 Around the chiminea, we have pots of rosemary, thyme, lavender and scented pelargonium – all very Mediterranean, in keeping with the style of this courtyard area. 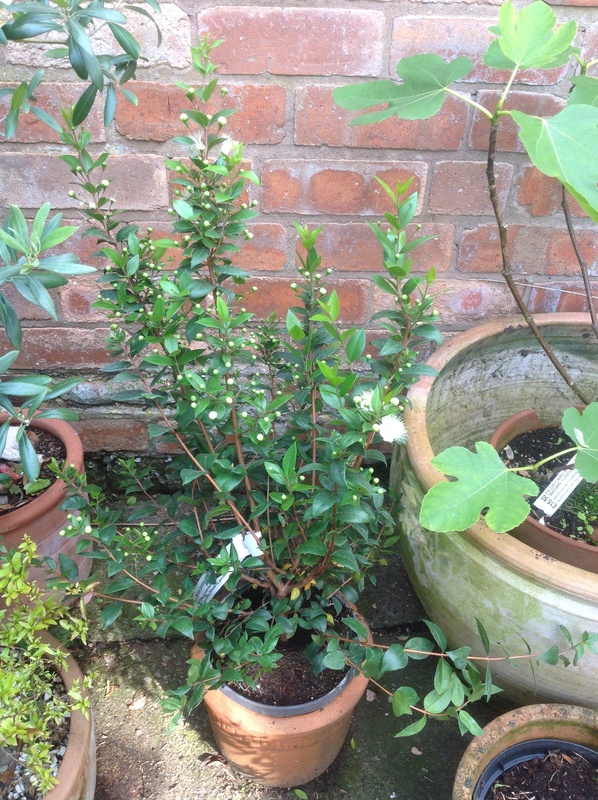 As well as a new addition of a Myrtle, which I’ve been after for some time. All we now need is the finishing touch of perfume, provided by the night scented stocks I’ve sown on the surface of each large, corner pot. Should be soon! 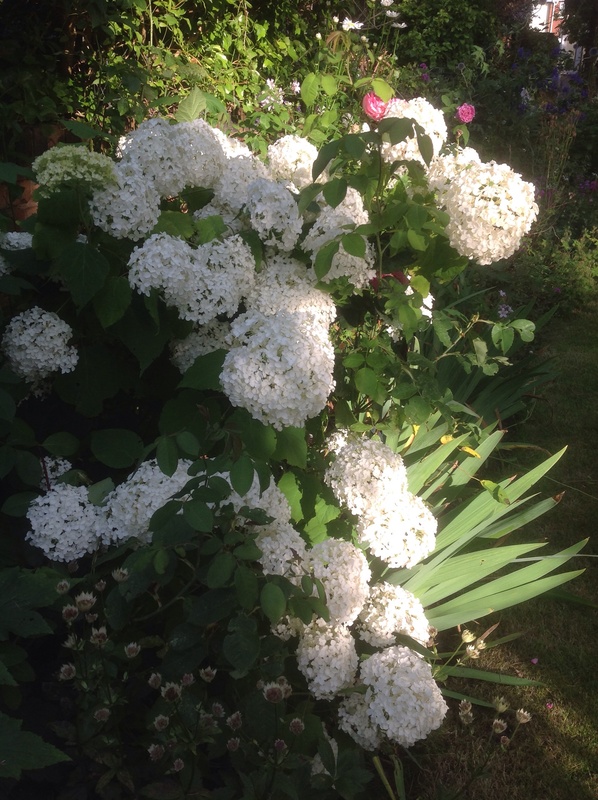 Elsewhere in the garden, I recently added two more scented shrubs to the mix. Introducing Itea illicifolia! This evergreen wall shrub has tassels of honey scented blooms, which are now flowering. The books tell me honey, but I detect lemony top notes first, before it deepens to honey tones. 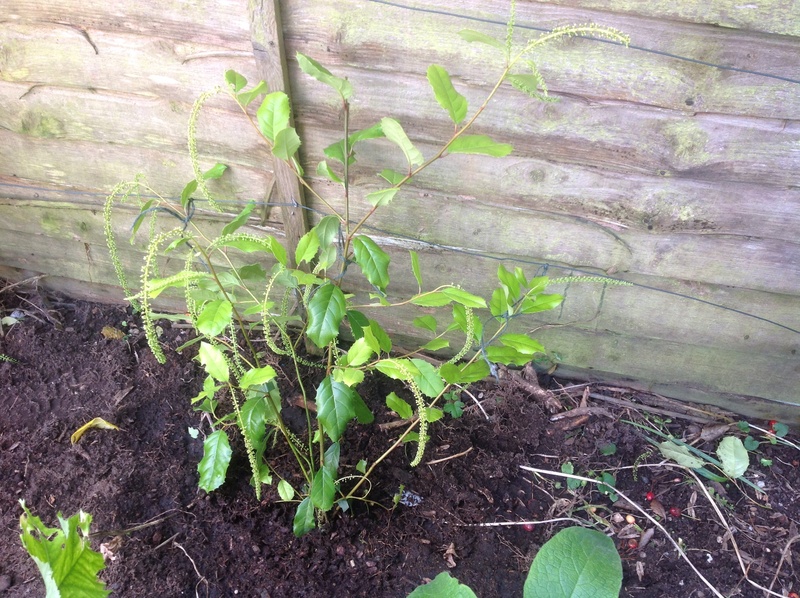 I’ve planted this alongside a Garrya elliptica. They are similar in appearance and habit, both producing tassels. Garrya displays it’s long silver tassels at the start of the year, (sadly unscented!) so I’m hoping they will work well together. 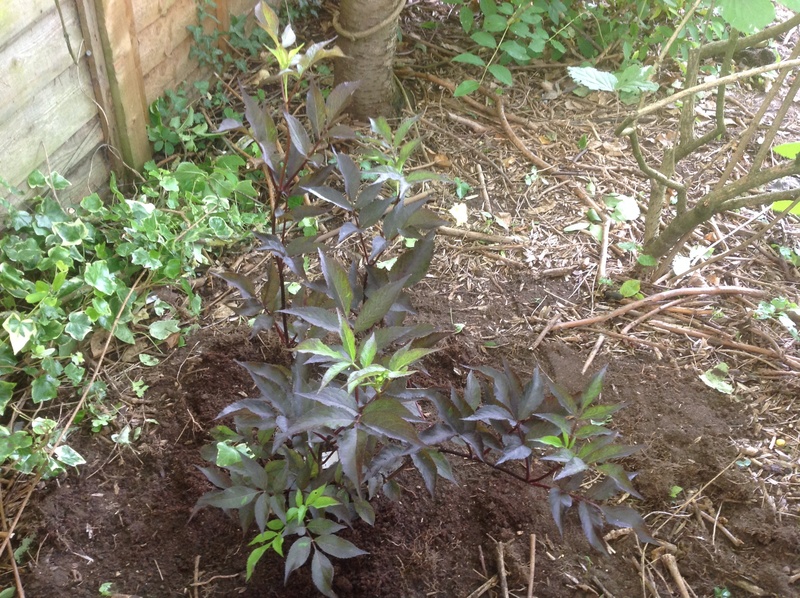 Now we have a dark leaved elder, Sambucus nigra “Gerda”, which has beautiful dark, nearly black, foliage, and pink clusters of elder flowers in spring. I’m told they are lemon scented, but anyway, I love the smell of elderflowers! In fact I’m rather partial to the taste as well! This has come about as a bit of an experiment, after a critical appraisal from my stepdad. He is a gardener of the old school – perfect lawns (preferably striped), plants in their allocated space standing to attention and everything pruned to within an inch of its life. I have to hide my secateurs! 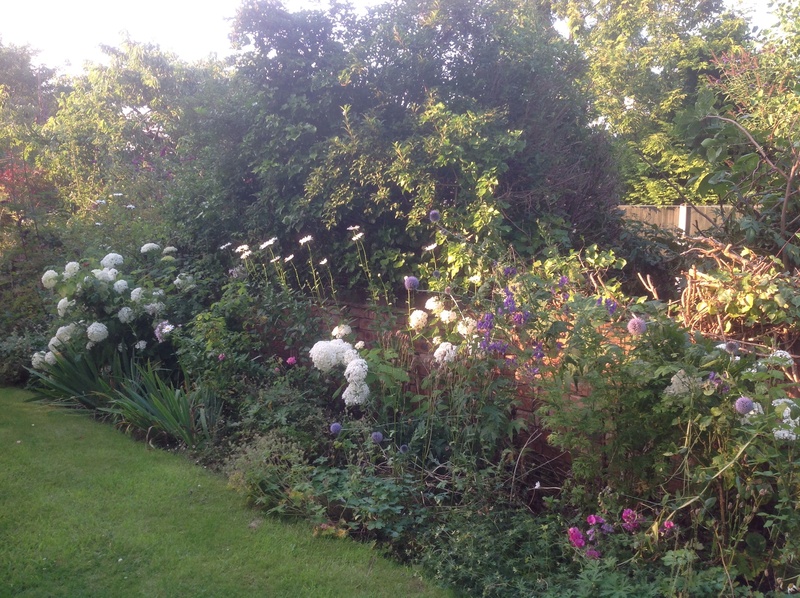 But he did make me re look at one part of my scented border. “Why were these shrubs spreading out at the front, leaving a big gap at the back? You should cut these out/get rid of them!” He had a point, but there was no way I was getting rid. Possibly the correct approach would be to dig them out and replant, but I didn’t have the heart! So hence the experiment. What could I plant at the back, in the gap, that would tolerate the shade and grow above the shrubs in front, and provide scent and interest? Well, elders naturally grow on the edges of woodlands, so I thought it worth a try! I’m keeping a watchful eye on it! But for now, I’m back to my aperitif! The sound of the summer breeze through the trees, has been joined by the sound of the weekly church bell practice. It must be heaven! This entry was posted in The Scented Path and tagged Elder, Itea, Jasmine, Mediterranean planting, Myrtle, Scented shrubs, Trachelospermum on July 24, 2014 by thelonggardenpath. A Day of Delight and Devastation! What a delight today has been! Sun and high temperatures – a perfect day for the garden! A day with lots of little highlights which just scream out “Isn’t life in the garden wonderful”! First we must get the devastation out of the way. It’s not as dramatic as it sounds – honest! The Philadelphus “Virginal” had been threatened with a drastic haircut. A bowl cut no less! Pruning by the book had resulted in vigorous new growth, which resulted in a plant that looked huge and gaunt, with strong, straight regrowth and huge leaves. So I decided to shorten all these long growths, in the hope of some branching lower down, with a more twiggy and pleasant, rounded appearance. Devastation, no less! But I think the results are more pleasing. The Philadelphus was not alone. 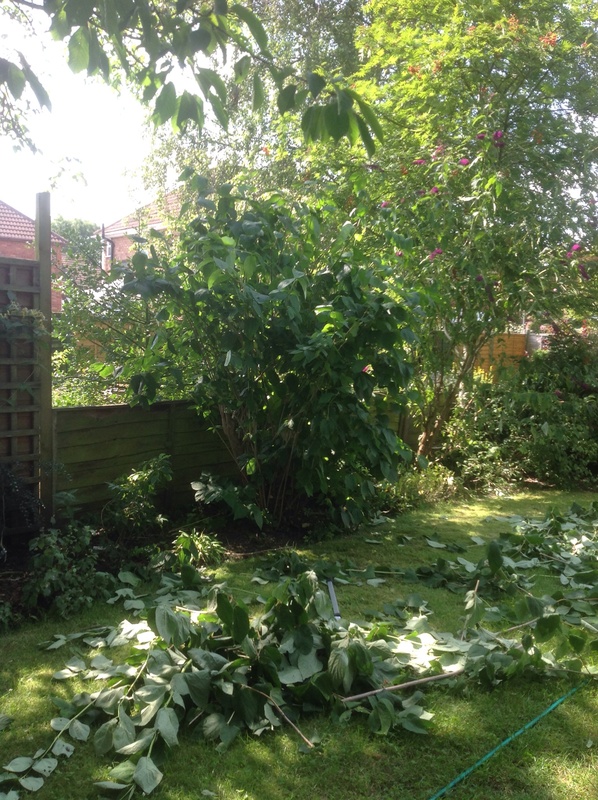 I apprehensively wielded the secateurs to our fruit cordons – not such a hacking venture. It did involve a lot of double checking with the manual, but I hope I’ve got it right. They certainly look more the thing! So devastation is not really the right word. Nerve racking tasks that provide delight with a satisfactory outcome. It was not all hard work. Among the watering and feeding, there was ample time to appreciate the many delights of the garden today. The Cottage garden has now reached its “teenage” phase, where it no longer wants to behave and just wants to sprawl about everywhere. Thank goodness for the late developers! I can’t rave enough about Hydrangea “Annabelle”. I’m so glad I added it to our Cottage border. It really packs a punch once the roses are past their best. I say “it”, I’ve repeated it another twice through the border. (I must confess, one is the very similar, Hydrangea “Bounty”.) Add to that the Leucanthemum, and the border takes on a distinctly white appearance, now, contrasting with the blues of the Aconites and Echinops. The rest keep ticking over. But it’s not all over, yet! We have another bite of the cherry, with our Grass garden, just coming into its own now, extending the garden’s season of interest a bit longer. No soft pastels here! It’s all hot colours and textures. It moves from golds and blues, through plummy reds with silver, and onto hot chocolates, oranges and bright reds. All softened with grasses. It’s been ticking over up till now, when it’s heading towards its peak. Once the flowering is over, the grasses and seed heads will keep the interest going well into the autumn, and even winter. Doesn’t the Echinops look wonderful against the lime-green of the hop covered fence? 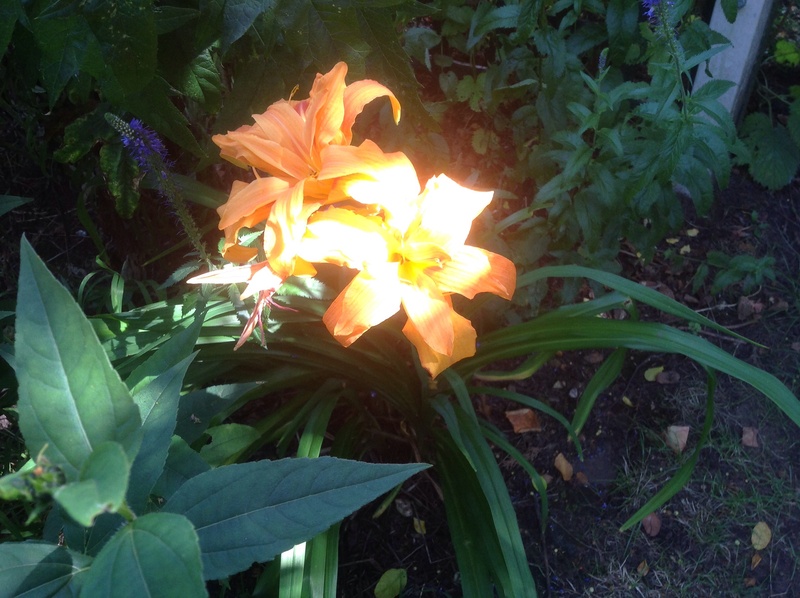 I love the way the light strikes this Hemerocallis! The “Allotment” was also delivering delights. Apart from the handful of Japanese Wine berries I displayed earlier, the rest of the patch was filling me with great pleasure. 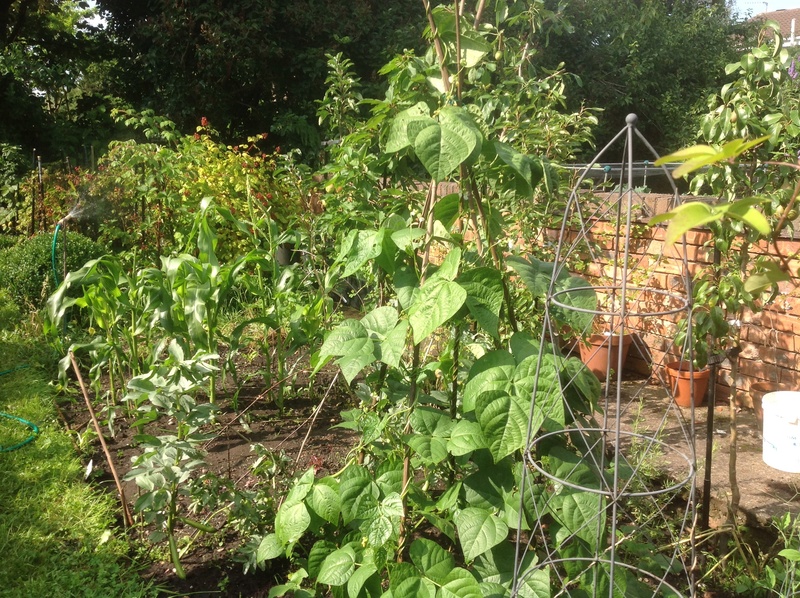 All planted now, and produce, such as broad and French beans, cornichons, lettuce, and artichokes, not to mention my very first sweet pea flower, were all starting to burst forth. And the herbs I added a couple of weeks ago, were well settled in. I also spotted a dragonfly flitting by, and as soon as my back was turned, a robin pinched my seat! (Doubling as my kneeling stool – sadly much loved – and hereby, showing my age!) All too fleeting for my camera. But I managed to catch one photo. (Annette asked for this, if I could!) 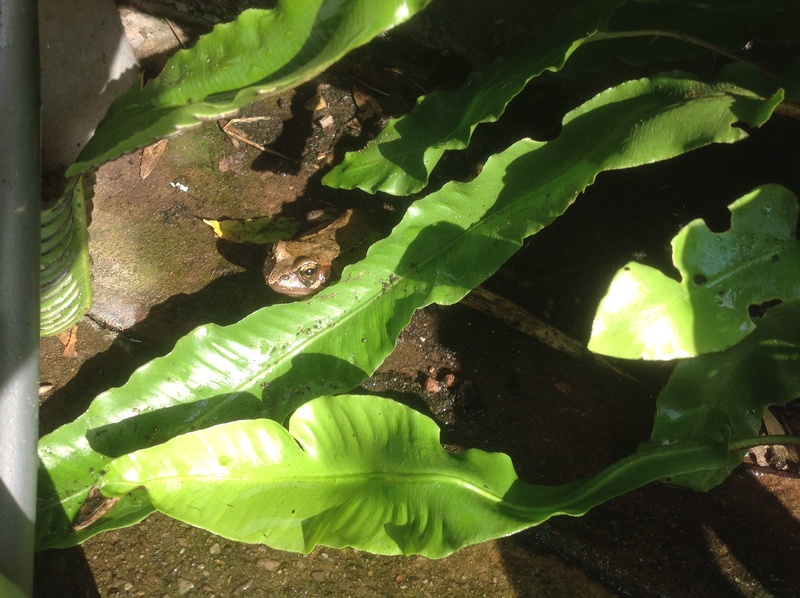 One of our frogs, sheltering behind a fern. 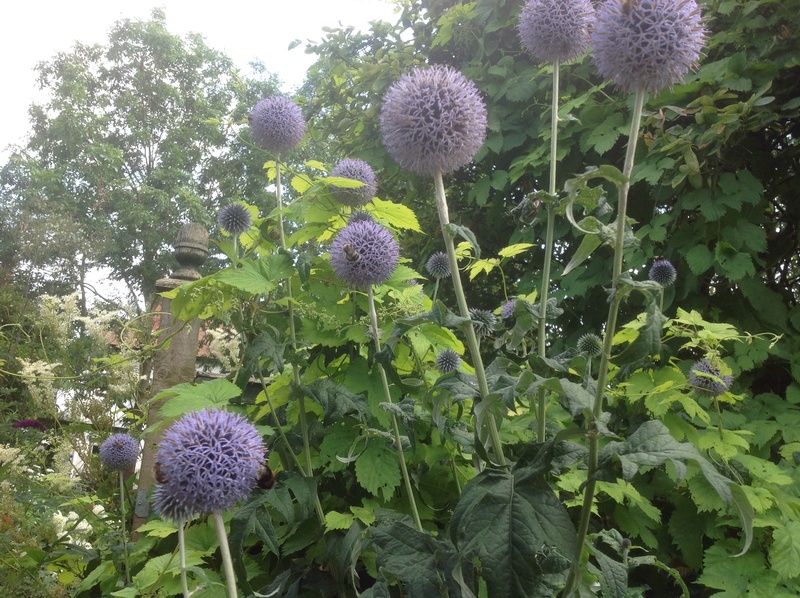 This entry was posted in Uncategorized and tagged Allotment, Cottage border, Echinops, Grass border, Hydrangea "Annabelle", Philadelphus, wildlife on July 22, 2014 by thelonggardenpath. Well, the garden at the Health Centre, is moving on. In case any of you don’t know what I’m on about, at the beginning of the year I got the chance to design a Health Centre garden. It was a quadrangle of the most horrendous layout, smothered with a sort of membrane, covered in wood chips and littered with boulders. Not in the least, a pleasing view from all areas of the surgery. “Tombstone city”, as it had been dubbed, was most accurate! On Friday, I was given some good news – and some bad! I knew my plans had already been accepted, and was waiting to hear about progress. And progress it has! The site has been cleared – done free of charge by the Estate manager, which freed up the money that would have been spent on a gardener to do the job, to be put toward the plants. So now, they have enough money in the kitty for the planting! Exciting stuff! 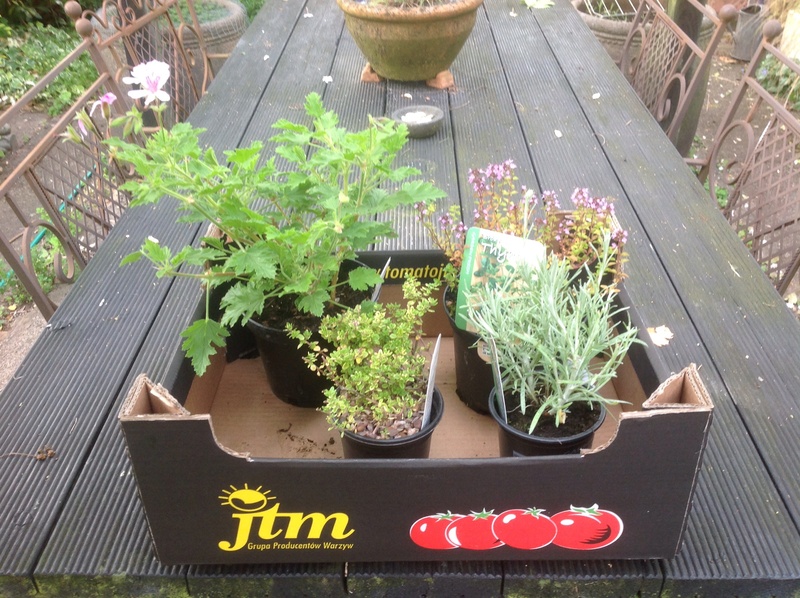 I must now look to fulfill my promise of supplying some of the plants myself, by propagation. As always, good news comes with bad, and this was no exception. After clearing, they realised it is weed infested – with horsetail! Help! Not one I’ve had to deal with, thankfully, and I believe it to be a bit of a nightmare (pardon the pun!) I need to do a bit of investigation. It will need to be cleared of that before any planting can go ahead. But otherwise, it’s all exciting stuff! I might be getting my hands dirty soon. Mind you, they usually are anyway, but you get my drift! 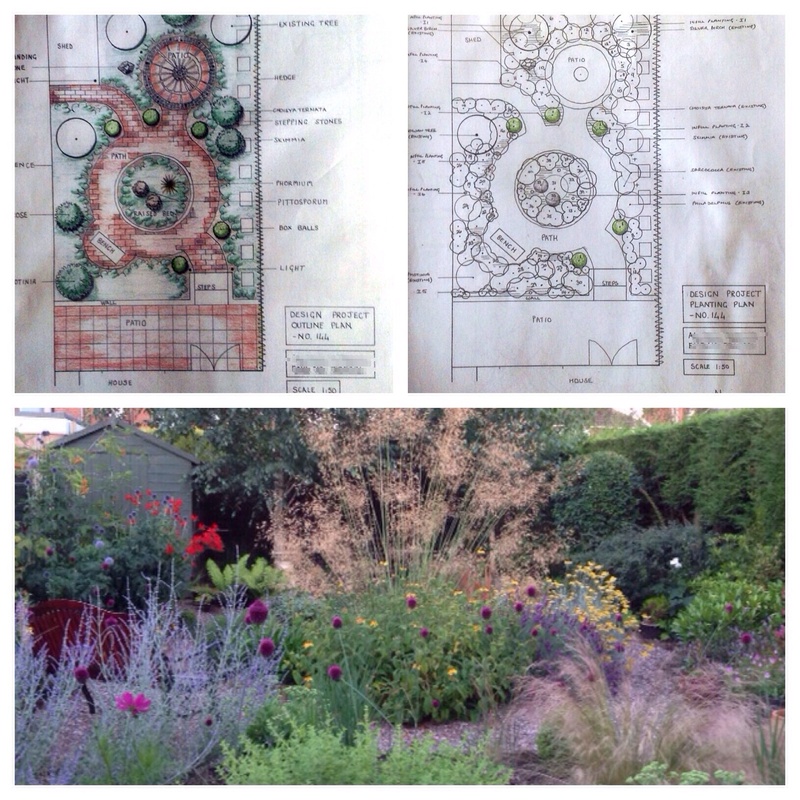 On the subject of garden plans, my mum sent some recent photos of her garden. I had used their garden for my final assignment, on my garden design course, and they are gradually creating it a bit at a time. It is a wonderful feeling, seeing what you have visualised and put down on paper, come to fruition. They are modifying certain elements, re the more costly hard landscaping, but I am pleased with the results. So pleased, I thought I might share the current progress. Progress of, not only their garden, but also my attempts with Diptic! 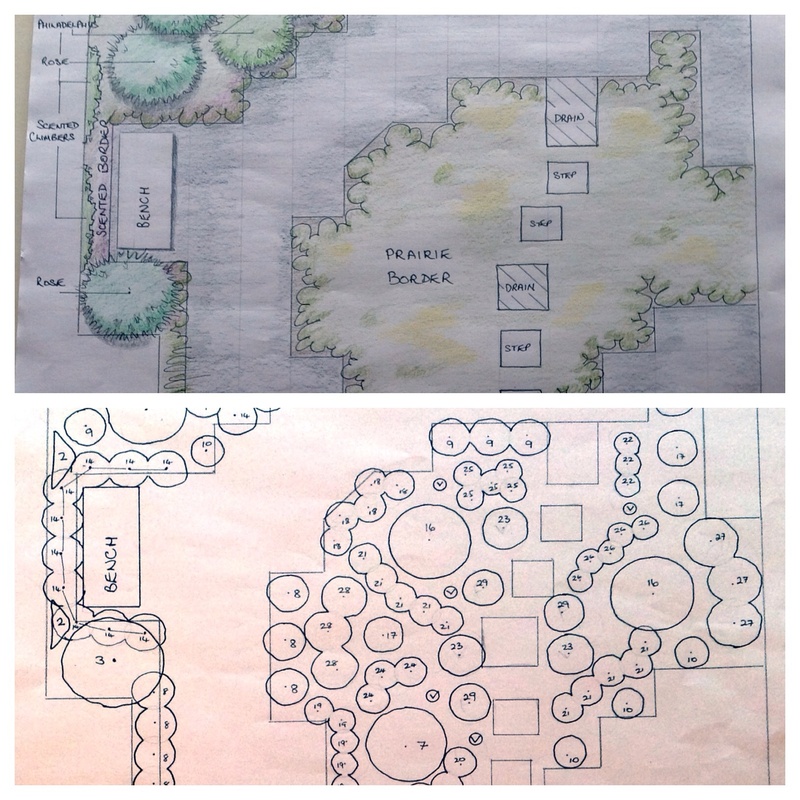 This entry was posted in Garden Design and tagged Garden design on July 20, 2014 by thelonggardenpath. If I allowed myself, I would have had a joint winner this month. I was so certain it was to be the vase of roses I showed you earlier in the month, in a moment of self satisfaction, but the next vase I did, had me struggling to choose between the two. And to remind you…. ….here is the first one! 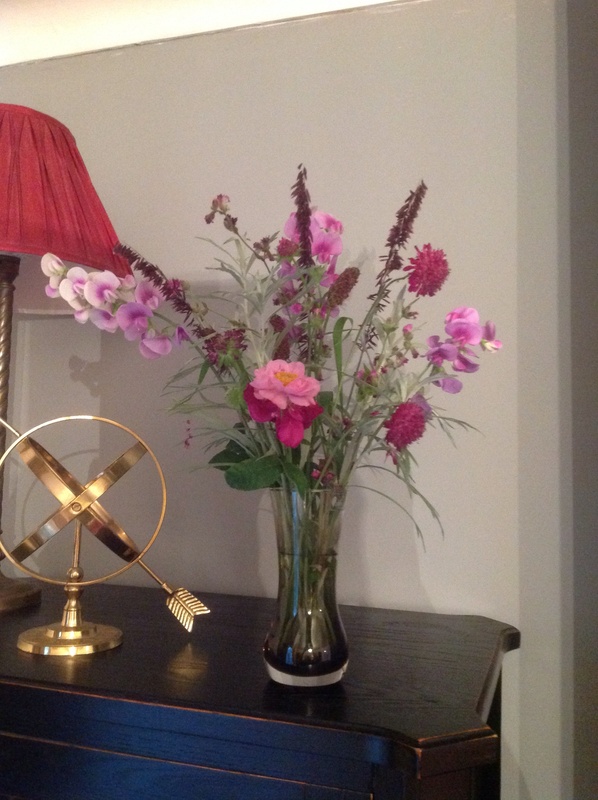 The centrepiece of the winning vase is a bloom of my Rosa gallica, which is a lovely magenta pink. 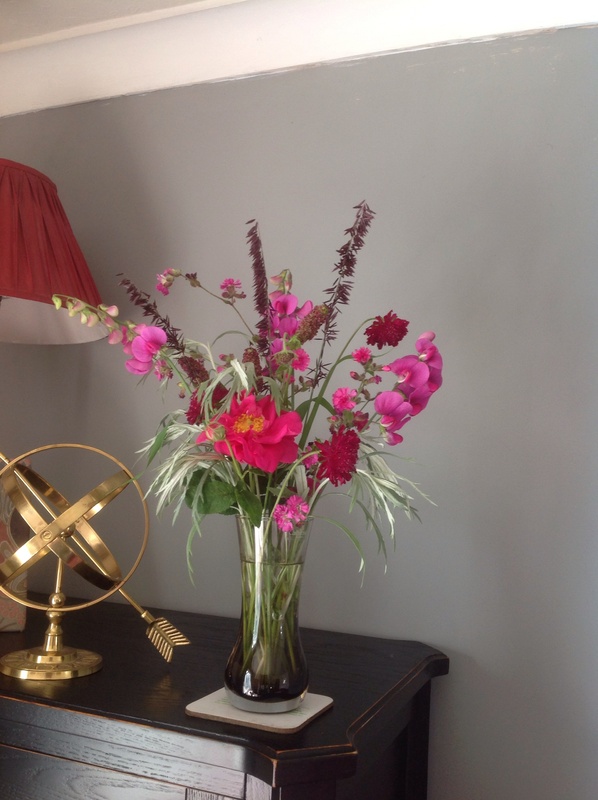 It is exactly the same shade of pink as the Silene I bought earlier at Malvern Show, growing alongside it in the garden, and I was keen to see how it fared as a cut flower. (Wellywoman? Just to let you know, it works well!). I thought it would look good contrasting with silver foliage, so in went some Artemisia ludoviciana. Sadly, they drooped immediately! I repeated the colour with some sprigs of everlasting sweet pea, added a darker shade with some Knautia and Sanguisorba, and then added a few flower spikes of Melica altissima “Atropurpurea” – a wonderful wine colour – for added textural interest. Voila! I finally made the decision, by considering how well they lasted. One week on and…. …. the majority of the planting is still going strong. The silver foliage quickly perked up once in water. The central rose, Rosa gallica has gone over, but been replaced with the adjacent bud, opening up a paler pink. The perennial sweet pea has faded to a pale, lilac-white. It really lasted well – it evolved! 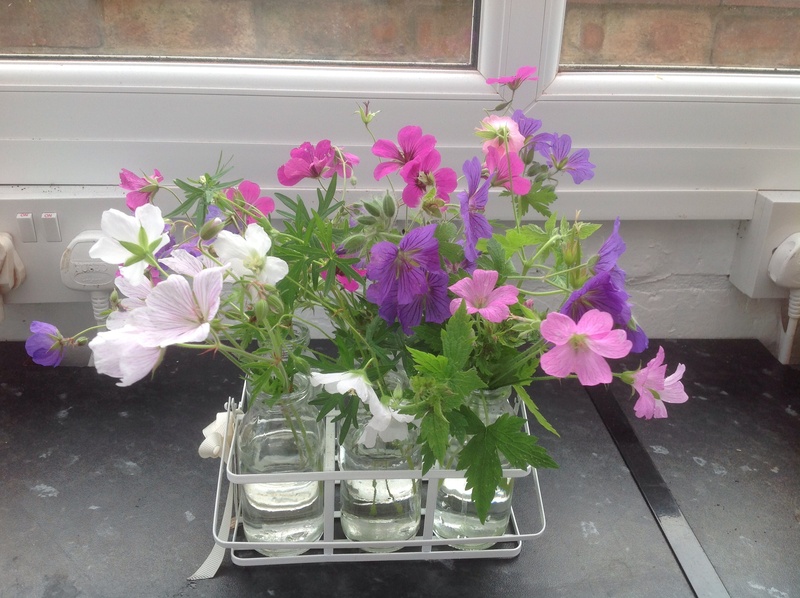 A single sprig of each of my geraniums in my milk bottle crate, made for a delicate display, and despite them dropping petals almost immediately (hence “confetti”) it lasted quite well. Pretty! 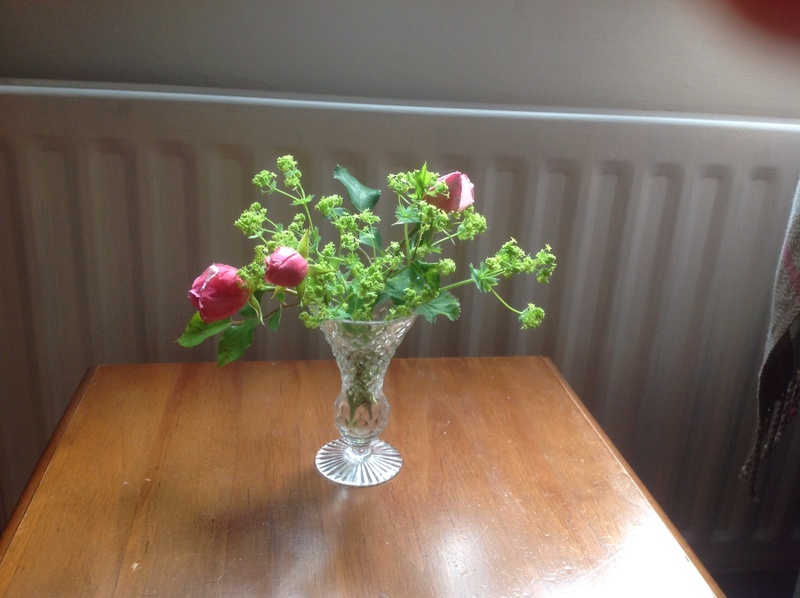 I had cut another spray of Rose “Albertine”, while deadheading, so it couldn’t go to waste – in went some Alchemilla mollis. This was a poor “A+E” contender. 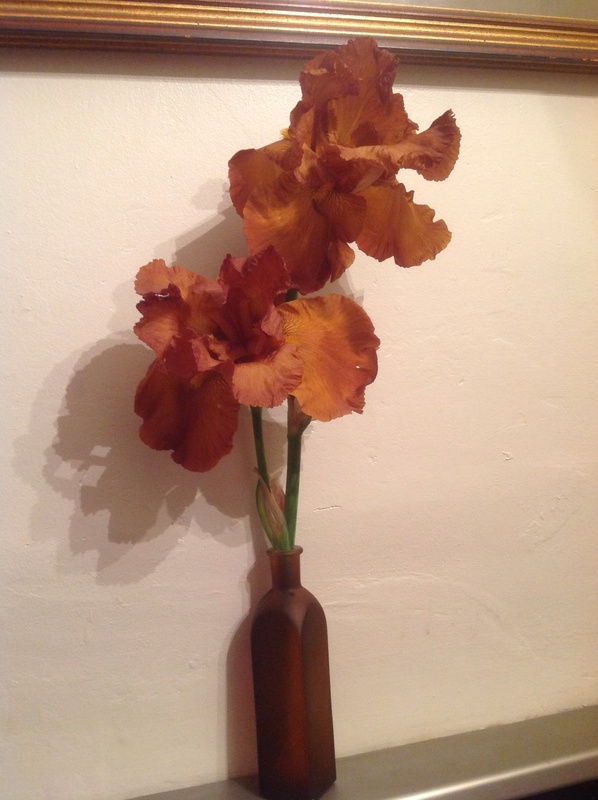 I found a broken stem of Iris “Cable Car” in the border – upsetting as it was a new plant and its only flower spike. Still, it wasn’t wasted. It made a stunning display in its matching glass bottle! 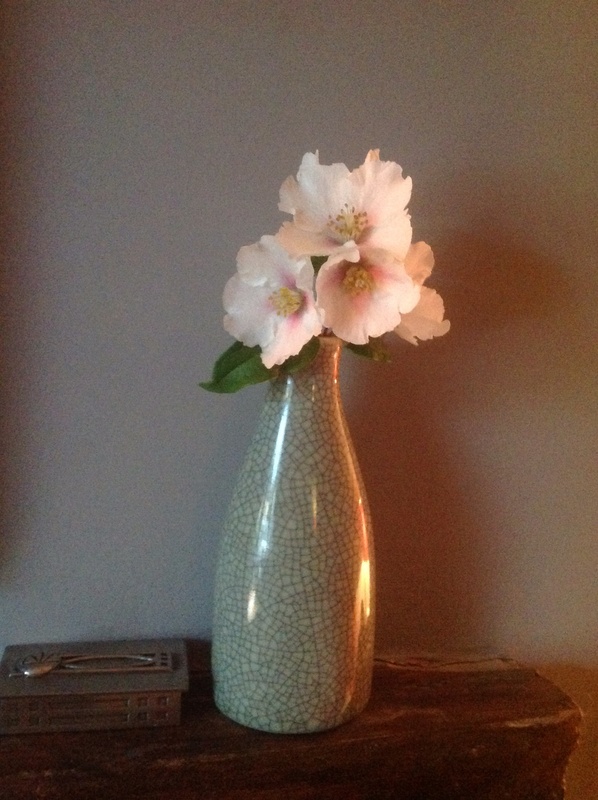 And finally, I had to bring the scent of Mock Orange indoors, with a cutting from my Philadelphus “Sybille”. Well, I’ve managed 6 months now – halfway to my goal. I think I’ll be keeping it up. I, too, am making plans now for a cutting patch! All recommendations gratefully received! This entry was posted in The Cuttings Calender and tagged cut flowers, grasses, Milk bottles, Roses on July 13, 2014 by thelonggardenpath.